Kate Middleton's dress is only the second most important fashion revelation this week - and probably won't be quite so funky. Ladies and gentleman, I present to you, the gigantic pink dinosaur look - or the dinosaur rose colossal as they're calling it on the catwalks of Paris. A month or so ago, Elizabeth made this dino hoody for her young lad and as I increasingly take my style cues from four year old boys, I knew I had to have one. 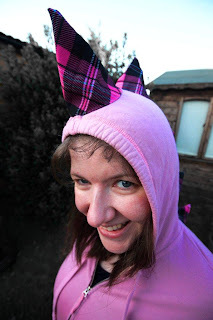 On eBay, I found a dip-dyed pink hoody and a very loud but very small pink tartan skirt from which I harvested the fabric for the spikes. I cut triangles with one side rounded to make cones. The tartan is polyester and whilst not especially thick, is rigid enough to stick out without stuffing, so it's perfectly comfortable to sit and lie down in - an advantage considering that that's what I do. One of the cones I flattened and attached to pink ribbon for a tail, but that wasn't hanging at its best angle for the photo. I began to write a little treatise here on the colour pink, which I see as a very politically-loaded colour, but to be honest I didn't think about anything political when buying the materials. I guess my thoughts were, this is going to look extraordinary silly anyway - pink may well take it to another level. 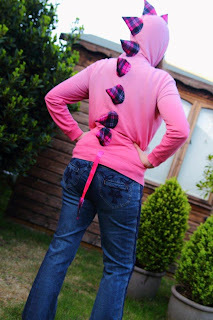 Anyway, I've written about pink before. Did I mention I was thirty? I love being thirty. 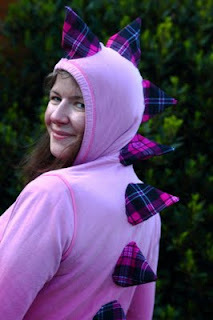 You can see more examples of dinosaur hoodies here. If you haven't already, please sign up to Blogging Against Disablism Day and help spread the word. Everything seems to be going really well so far. Recently, I began watching modern adaptations of two of my absolute favouritist books in the whole wide world ever; the new BBC adaptation D. H. Lawrence's Women in Love (which turned out to be a heretical mash-up of the book of that title and The Rainbow) and the 2008 film of Evelyn Waugh's Brideshead Revisited. Truthfully, I didn't finish watching either and yes, that means I'm not allowed to review them. They might be okay - sometimes film-makers do magic with a book by ripping it to pieces and sewing it back together again (e.g.,Trainspotting where the film is ten miles better than the book). I'm afraid these two books were a little too precious to allow me to persist. Both adaptations, as far as I saw them, wound me up in various ways but there was one thing they had in common. Both books have a major bisexual male character (Rupert Birkin and Charles Ryder) and in both adaptations, their sexuality was changed. Birkin becomes a homosexual who dabbles with women, and Ryder becomes a heterosexual who dabbles with (horribly caricatured camp) men. It is as if, in the early twenty-first century, we are less able to cope with sexual ambiguity than in the mid-twentieth when these books were published. Or indeed the late twentieth when we saw Alan Bates and Oliver Reed wrestling naked and a young Jeremy Irons gaze longingly and lovingly at the beautiful Anthony Andrews. Our culture seems to struggle with sexual ambiguity and fluidity, outside the context of an attractive young women who might be prepared to swing both ways for our titillation – but that's sexual performance rather than sexuality. Apart from Captain Jack, bisexual men are almost totally absent from film and television drama. Everyone must be gay or straight and easily identified as such. Even if a character has sexual or romantic relationships with members of more than one gender, they must always turn out to be one way or the other. I guess there are a few things going on here. One is our cultural obsession with labelling. Trouble is, there are contexts in which labels are essential, to help us talk about our experiences and most especially in the context of addressing social injustice. But people try to make our labels more than they are. For example, take being gay man - there are, after all, far more gay men in films and drama than any other queer people. and that's before we get onto being flamboyant and sensitive, having an interest in fashion, musical theatre and the rest of the stereotype. Being a gay man only means that the people one is sexually and romantically attracted to are overwhelmingly men. Roughly. But even then, I'm thinking, it's not that simple. Even so, sexuality does not equal sexual behaviour, let alone social behaviour – in fact, historically, many people have lived their entire lives without expressing their sexuality at all. Neither Lawrence nor Waugh used the word bisexual, but the characters of Rupert Birkin and Charles Ryder both had deep romantic and sexual feelings towards both men and women. Ryder has a romantic affair with a man and later has a romantic affair with a woman, who he wants to marry. Birkin is somewhat in love with his best male friend and gets a tremendous kick of physical contact with him (as his friend does) as well as other men. But he is also properly in love with a woman, even if he is a bit sexist and will insist in over-thinking it all (Birkin, the merkin, over-thinks everything). I wonder sometimes if there is even more scepticism about bisexuality or pansexuality now than in days of yore when homosexual behaviour was unacceptable. Many gay people experience hopeful disbelief from family members that perhaps they just haven't found the right man/ woman, but I think there is more general scepticism around non-binary sexualities – even among gay people. Of course, many male public figures have describes themselves as bisexual before later coming out as gay, which doesn't help. But there is also this utterly bizarre cultural presumption that men are so hot that androphilia is the default. Bisexual women are generally presumed to be particularly adventurous straight women and bisexual men are presumed to be closeted gay men. It seems that we have become especially wedded to the idea that there are two paths of masculinity and no cross-over; there are men who love women and there are men who love men, who are completely different in every conceivable way. In films and television drama, they play very different roles, they frequently walk and talk differently for ease of identification, they have very different motivations and interests. Bisexual men would mess up this binary – what's the chap going to do? Is he going to blow up the building or merely replace the curtains? Is he going to to fall for the helpless blonde or the geeky male sidekick? A dramatic world in which there are no gay heroes (unless they are very very tragic or very very comic) limits what everyone is allowed to be and eliminates bisexual characters altogether. And this wasn't always the case. Big Hollywood movies force some degree of simplification and come from a different country anyway - here, gay characters from books, even history books, are frequently straightened out. But I honestly wonder whether our culture has stopped exploring gender and sexuality. British cinema of the sixties and seventies, and much of British television drama through into the mid-nineties featured all kinds of different masculinities – often, in fairness, neglecting any variation in femininity. But it's not like women's representation in films and drama has improved in leaps and bounds during this period of masculine stagnancy – our screens are still abound with worlds in which the only women who matter are young, white, pretty with the same motivations as the young, white and pretty women of the 1950s (except they had natural curves). When making adaptations of sixty-three and ninety-one year old books means simplifying and sanitising sexual matters, then I think that we're not nearly so sexually progressive as we imagine we are. Being published in 1920, Women in Love is out of copyright and is on Gutenberg and Librivox. Brideshead Revisited was published in 1945 so we have a few more years, but it is absolutely delicious and well worth paying for. Throughout this post, I've used bisexual when that's not exactly what I mean. See Generbitch's excellent post on Bisexuality, Binarism and Why Everyone Has It Wrong. Unfortunately, I wasn't sure how to phrase this more accurately without using a lot more words and possibly a glossary. But this is the trouble we have; labels which liberate in one context, are frequently inadequate to describe the subtleties of human experience. And when we lose these subtleties, we leave some people and their experiences out.